I sent in all of my (overdue) paperwork today! I am so excited. I was hoping that tonight some friends could come to liturgy and then go check out the Christmas lights at the Mission Inn, but that's not going to work out, so I am rather disappointed about that. 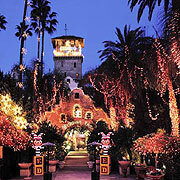 I love the Mission Inn at Christmas time. It's so beautiful! I've also received return correspondence by e-mail from Fr. Stephen Platt in Oxford, and I am excited to meet him and to visit his parish. Must go. I'm working on a craft project. Really. I am.